Old Lyme pulled off a huge win yesterday evening when they defeated Cromwell 3-1 at Cromwell High School. Maddie Ouellette was the first to score for Old Lyme from an assist from Mya Johnson. 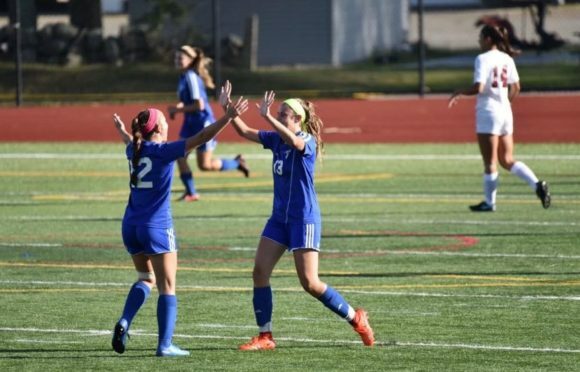 Jenny Ritchie followed up with a goal off an assist from Danielle McCarthy and the Wildcats’ final goal was scored by Mya Johnson assisted by Caroline Wallace. In goal for Old Lyme was Emily Rivera with nine saves. Cromwell’s lone goal was scored by Olivia Belcourt; Jessica DellaRatta was in goal for Cromwell where she made 14 saves. Old Lyme is now 10-0-0 overall and 6-0-0 in the Shoreline Conference.